Many industrial applications of particle accelerators are particularly useful for the automotive industry. Indeed, components such as tyres, foam, ball bearings, gears, camshafts and tie-rod ends are produced using either electron beam thermal processing or irradiation. 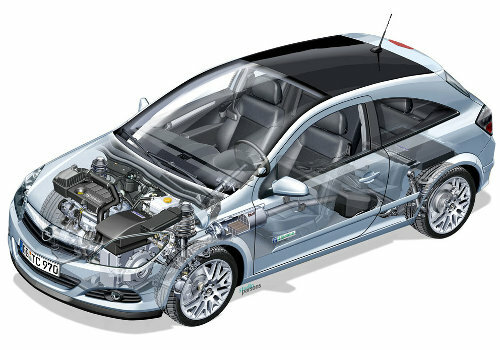 Modern ion implantation systems make the advanced electronic systems in cars possible. The list of items in the case study above and in the table below is not exhaustive. Surface hardening can benefit any object that undergoes stress, extreme temperature or experiences wear. Most of the moving parts in a car could benefit from surface hardening and from new methods like ion implantation and material irradiation. Some items in the above list may not currently be used in car manufacturing, such as carbon fibre cassis, but are on the horizon of future developments in the manufacturing industry. Other potential advances not included on this list are in the area of alternative fuels. Advances in hydrogen fuel and hydrogen fuel cell technology could see hydrogen powered cars become a reality in the future. Research into this is being carried out around the world and synchrotron radiation generated by particle accelerators is one of the key tools. Also biofuel researchers have found that treating fuel with electron beams can improve its quality. Below is a list of the articles used as reference to write this page. For anyone looking for more information on the role of particle accelerators in the building of a car both now and in the future, it can be found in the links below. Robert W. Hamm and Marianne E. Hamm, Eds., “Introduction to the Beam Business” in Industrial Accelerators and their Applications (World Scientific, Singapore, 2012), ISBN-13 978-981-4307-04-8.